I first came across this recipe here and then here. I have always ignored these greens during my trips to the grocery store as I never quite knew what to do with them. Here is my way of preparing these healthy greens. Heat the oil in a pan & add the ingredients for the seasoning. Sauté the onions. Add the green chillies & the ginger paste followed by the sambar powder. 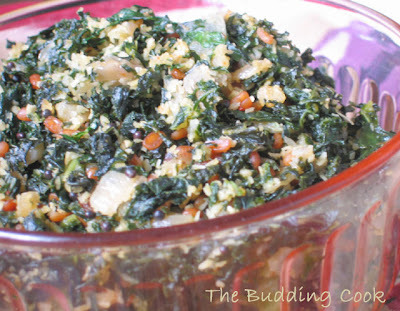 Mix in the finely chopped kale, stir well & cook for about 8-10 minutes. Add the coconut powder & mix. Cook for anther 2 minutes or so till all the water evaporates. Add salt to taste. On a totally different note, here is something I came across while I was wilfing on the web. If you have a couple of minutes to spare, do watch the entire thing. It is about 10 minutes long. Hi, wanted to thank you for your comment. It feels good to hear it. Your blog is fabulous and the photographs are even better. May I ask one quick question? How do you put your logo on the pictures before posting them? Thanks. Thanks a lot. Will try it out next time onwards. I love to saute the greens with shallots and coconuts. they taste great with rice. I would say Lions survived the Baffalos!!Hahaha!! have heard a lot @ the nutrition in them kale! ur version of using this leafy green looks delicious. Very nutritious. I should try this sometime. Never cooked with Kale. Got to give this a try. I've never had kale before. Does it taste like spinach? Kale is great. It's very good in risotto and frittatas too! Your dish is quite handsome. wow! this certainly looks healthy.. thanks a ton for your wishes, TBC. can u please check back and let me know if you can see the pics now.. have reloaded them..
have any idea why this is happening? :( Really disappointing..
TBC, that video is stunning! We went on many a safari and were witness to an exciting hunt where a Momma cheetah killed a Thompson's gazelle for her cubs. But this is something else, I tell you! Never seen anything like it before! Kale looks good. I let my friends treat me to kale. I haven't cooked it either! BTW, you have an award you should pick up! Have fun! Hi , Here for the first time. What's your name? Liked your blog in general and the you tube video! My son is an animal lover so we are upto date on these stuff. I just watched this video today a few hours ago. Almost 8 years back we watched a programme in which cape buffaloes out smart a pride of lions. BTW Thanks for visiting my blog and leaving a comment.I could'nt repond as I was out of station. Wasn't that an amazing video?! I too don't like raw kale... I'll bet it would be yuck!! Hima, do try it at least once. I think Kale is slightly bitter when compared with spinach. It also takes a little more time to cook. I was simply amazedby what I saw on that video. I should now try using it in the ways you mentioned. I will check & let you know. Again, thank you somuch for the award. You just made my day! Welcome!I go by the name of TBC ;-). I saw the clip on YouTube over the weekend & I just had to share it. BTW, you have not made your blogger profile public so I cannot reach you through your blog. I havn't ever tried using kale till date. Thanks for the healthy recipe. Look at you 'linking' all around ;-) and the recipes are pouring too! The photographs are great...I also like this one of the bare tree in a snow covered landscape! Beautiful. Looks delicious TBC, I am always looking for healthy and quick recipes, will certainly try this. i saw that battle of kruger video a couple of days ago. amazing, isn't it? it's great to see recipes with greens like kale and collard. i love them. I know!!! I'm learning a lot every day, don't ya think? I too love that pic. That was the view from our balcony in Buffalo, NY before we moved. I just loved the winters there, sigh! Do let me know how it turns out. For the first time since I moved here, I am actually taking a good look at all the veggies in the produce aisle.Previously, I used to cook with the same 6-7 veggies for god knows how long! I saw that video some days ago. Incredible, Isn't it? Any another option for coconut powder my dear....may I use peanuts powder or not? Kajal, that is such a great idea!It would add some extra crunch to the dish along with a nutty flavor.